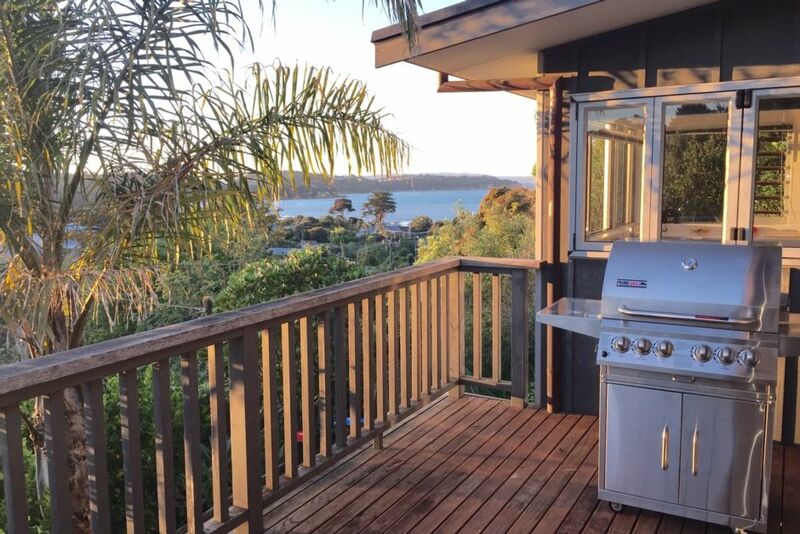 A spacious three bedroom modern luxurious holiday home that sleeps 6, set in pristine unspoilt native bush and palm trees with great sea views from two decks. Completely private on a quiet road with very little through traffic. A very child friendly safe beach and a playground is at the end of the street (only a couple of hundred metres easy walk). Only a few minutes drive from the Matiatia passenger ferry and the world class Cable Bay and Mudbrick vineyards. Set over three levels with sea views from the lounge, modern designer kitchen and the two decks. The large designer kitchen is truly luxurious and features stone bench tops, a Rocket espresso machine, dishwasher, new microwave and large double fridge freezer. Two modern bathrooms - one with an ensuite with shower and the second one with a shower over the bath tub. Wide sliding doors open from the open plan lounge to a large deck with lovely views of the bay, shrouded by nikau palm trees and native bush, providing a perfect indoor - outdoor flow. A second deck also has views to the bay below. The choice of outdoor living areas and relaxing indoor spaces make this an ideal holiday retreat. Sit back and relax among the abundant bird life, including Tuis and Kereru (native Wood Pigeons). A quiet peaceful location makes for the perfect hideaway or getaway from the stresses of everyday life. A refundable bond is required for all bookings. No smoking, pets or high heels on the wooden floors inside please. yuck needs a good wash,but once inside a lovely comfortable place to stay BUT several light bulbs are out plus new batteries are needed in your tv remote, instuctions needed for your coffee machine.enough of complaints .We had a lovely 5 nights stay and saw the whole island enjoyed the dinners at the club.Thanks again Dave--- Ben. Lovely house in a nice central location. Just keep the doors shut at night and use the air conditioning to avoid mosquitoes. Excellent holiday house. Everything you need. Lovely view from the deck! Excellent holiday house. Has everything you need and is a lovely place to stay. Note that the bunk room is quite separated from the main two bedrooms if you have young children. A dryer (although not necessary in summer) would’ve been nice to dry towels for swimming. The house was nice and only a 15 - 20 minute walk to the main Oneroa shops. Lovely view from balcony and kitchen. Close to other local shops but I would recommend the main shops in Oneroa, as they have better choice and are more reasonably priced. Great house, including large terrace and fine sea view. Great house, including large terrace and fine sea view. High standard of kitchen, furniture, beds, etc. It is a bit off Oneroa centre and to maximise your holiday experience you will need a car throughout your stay. The heat pump/AC were not in order during our stay and there was smelly odor coming from the waste water pipes. We had to close windows and no A/C working which was not ideal. Thanks for your feed back - yes sorry we had a faulty heat pump / air conditioning unit which has now been replaced by the latest brand new (very quiet) Mitsubishi unit.